Solid mini-drones are great for those who want to learn more about flying drones. They’re not as touchy or cheap as nanos, but they don’t require the skill or the overall level of involvement in the hobby that larger drones require. In this article, we’ll take a look at one of the many smaller drones out there. In our Holy Stone HS170 Predator Mini RC Helicopter Drone review, we’ll take a look at the drone’s specifications, special features, flying experience, controls, and even other user reviews to help you figure out if this is the right drone for your needs. In our Holy Stone HS170 Predator Mini RC Helicopter Drone review, we found that the most admirable attribute of this drone was its headless mode. When engaged, the drone can be flown more like a character in a video game than like a remote-controlled flying device, allowing users of any age to get more out of the flying experience. Most users tend to like how easy this drone is to fly, both in that headless mode and in the standard control scheme. While it’s light on special features, the drone is very nimble and is a great unit for learning how to fly. Most of our Holy Stone HS170 Predator Mini RC Helicopter Drone review flight took place indoors, which is honestly the best place to fly this drone. While the drone is billed as being wind-resistant, the truth is that anything more than a slight gust is going to cause problems when you’re flying outside. 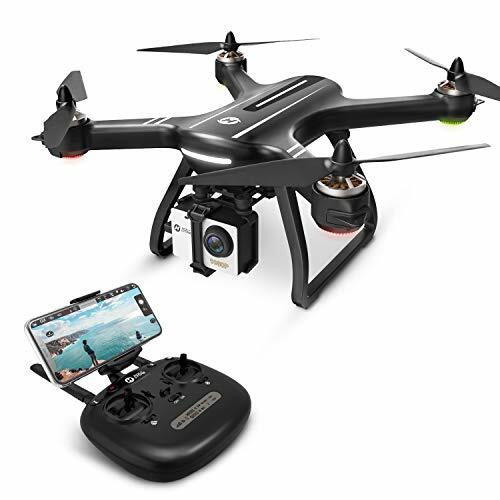 If you’ve got an exceptionally clear day, it’s a great deal of fun outdoors - otherwise, you’ll want to keep this drone inside so that it doesn’t get taken away by a stray burst of wind. This isn’t a professional grade drone, so most of what you’re going to use this device for is pure entertainment. It’s got the capability to do a few basic tricks, but most of the joy you get out of it is simply going to be from being able to fly it around. It’s not a complex device, depending on four helicopter-like blades to keep the device in the air. It is, however, balanced by gyroscopes which help to keep it from flipping over no matter how quick your maneuvers. It’s the same basic type of technology that keeps most mini-drones flying, but that doesn’t mean it isn’t implemented well here. One of the most pleasant surprises of this Holy Stone HS170 Predator Mini RC Helicopter Drone review was the controller. While it’s not as a fully-featured as some of the high-end drone remotes, it’s still a very nice controller that allows you to fly the drone without requiring you to depend on a smartphone. It’s very much in the vein of old-school video game controllers, which does make the flight process a little easier than you might expect. It naturally fits in your hands and everything you need is fairly easy to reach even if your hands are on the smaller size. It would certainly be nice if the controller had a bit more weight to it, but it’s not bad as it is. This drone does not, however, ship with many accessories. In addition to the drone and controller, all you’ll get in the package is a set of extra blades, a screwdriver, and a manual. The manual is a must-read, of course, but the thing you’ll find the most useful is the extra blades. Because of the small size of this drone, you’re eventually going to crash it - and crashes are going to be rough on your drone’s blades. The replacement parts will help you keep flying without forcing you to rely on Holy Stone’s admittedly very good customer service. A customer review of the drone has a lot of praise for how the drone works. Most importantly, the user also tries to remind other owners to read the manual before attempting to fly the drone. He notes that failing to properly sync and center the device will cause flying problems - but that those problems go away after following the directions. Another user is a fan of the drone in general but has some issues with the battery and charger. Quite a few users have actually noted similar battery issues, but they also note that Holy Stone is good about sending out replacements when necessary. The final user praises the drone as a great starter. He has had a great deal of fun flying it around and has also noted that Holy Stone is very quick when dealing with any drone problems. What’s the conclusion of our Holy Stone HS170 Predator Mini RC Helicopter Drone review? Given the ease of flight and the relatively solid controller, we consider this drone to be a good choice for those who are starting to fly. It’s definitely a stepping stone to something much bigger for most would-be pilots, but it’s nonetheless a great toy. While you probably want to fly this drone inside as much as possible, getting out into nature and putting it through its paces can be a lot of fun. This is definitely a solid drone for newer pilots. Our opinion isn’t the only one that matters. Did you have a different experience with Holy Stone HS170 Predator Mini RC Helicopter Drone? If so, share your opinion in the comments!